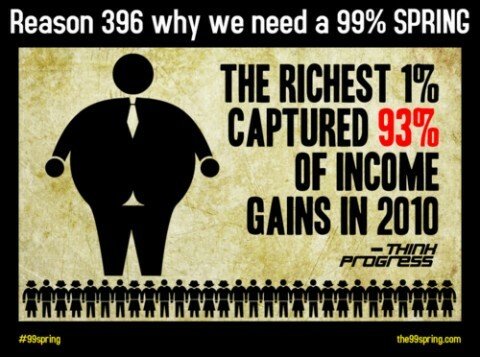 reverse Robin Hood | STOP Framing "us"
The top 1% took in 93% of all income gains in 2010. What does this transfer of wealth mean for our country? The most critical issue affecting the majority of American citizens that is rarely discussed by political pundits, including those on the left, is the fact that in order for the top 1% to rake in 93% of all income gains in 2010, as illustrated in the chart below, a transfer of wealth must take place from all of “us” to a select few of “them.” This is how it becomes possible for the top 1% to pile up such massive amounts of wealth to the point where just 400 households, (those at the peak of the pyramid scheme they have turned America into) can possess more wealth than 154 million people combined (half the U.S. population). Startling figures like this is what makes radical right wing initiatives, such as Paul Ryan’s budget plan so extremely important, since the implementation of our budget and tax policy not only determines the moral values we set for our nation, but also who benefits in our society. Should everyone share in the success we all help to create, as reflected in the past when we implemented moral budget priorities and a progressive vision for our future? Or, should we continue to adopt radical pieces of legislation that further widen the gap between those in the top 1% and everyone else, as seen in the fat cat illustration above? This chart from the Economic Policy Institute reflects how the growth in income was shared between those at the top and everyone else during what was known as the ‘Golden Age of Capitalism’ (1945-1975). During this time period, our political leaders recognized that higher tax rates on the super-rich were advantageous to our economy and nation as a whole. This ‘Golden age of Capitalism’ led to the creation of a thriving middle class, where the majority of people (including those at the top) benefitted, as opposed to only a tiny minority reaping all of the income gains. Contrast the ‘Golden age of Capitalism’ with the time period immediately following it when Ronald Reagan came into office in 1980, and ending when George W. Bush left office in 2008. During this period, our conservative leaders decided to drop the progressive vision for America that was working to benefit us all in favor of a radical right wing ideology that focuses strictly on what benefits those at the very top. It’s no surprise, given the shift in priorities that an unconscionable amount of profits were captured by those at the top, while a mere pittance of 2% of all income gain during this time period was made available for the rest of the people (90%) to share. The problem we face today is that the tiny minority in the top 1% has been very successful thus far at implementing this radical vision for America and getting what they want. This is largely accomplished by consolidating and controlling the media (ie, corporate media) in order to develop a well functioning ‘echo chamber’ to spread misinformation and “frame” the public to believe conservative politicians are actually trying to “save” and “strengthen” Social Security and Medicare, and help create a path to prosperity for all. If we continue to believe this nonsense, then the GOP’s “path to prosperity” for the top 1% will continue to be paved, which means the rest of us will be faced with drastic cuts to vital services that will initially affect the most vulnerable populations among us, (the working poor, sick, and disabled) but will eventually affect us all every time they seek to re-pave the “path to prosperity” in the future. We must understand that this is the conservative version of morality, and their tax and budget policies will naturally follow from their moral principles, which are first and foremost to protect and enrich fellow members of the upper class at the expense of everyone else.